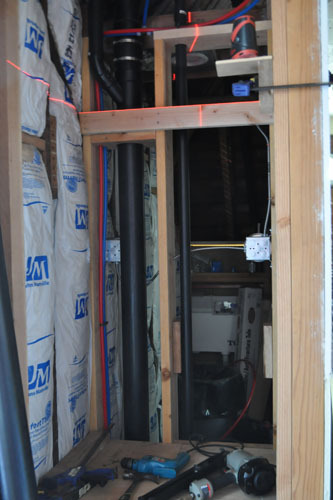 We have been fiddling with plumbing to get the rough plumbing ready for inspection. That is not ready quite yet, but close. 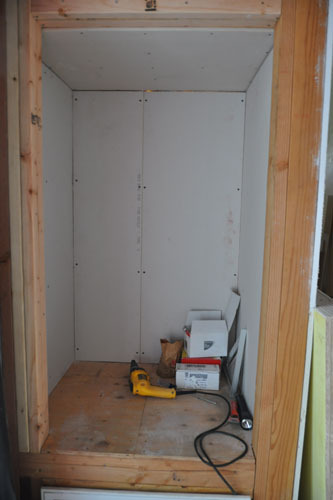 In the meantime, Noel decided to go for something actually reachable and got started on finishing off the closet. He started by getting a level line where the upper half of the closet will go. We could have had a shelf inside the closet but that would not be particularly strong, and also if the door looked even halfway reasonable it would be hard to get to the shelf. 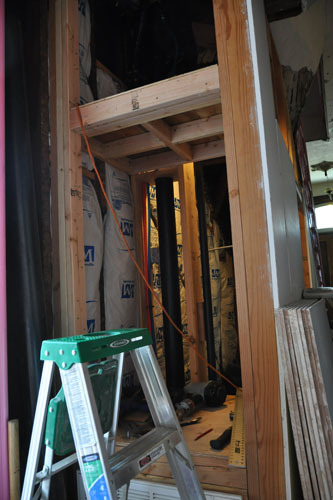 So the upper half will have its own door, and it has a floor that an adult human can sit on to mess with the plumbing. 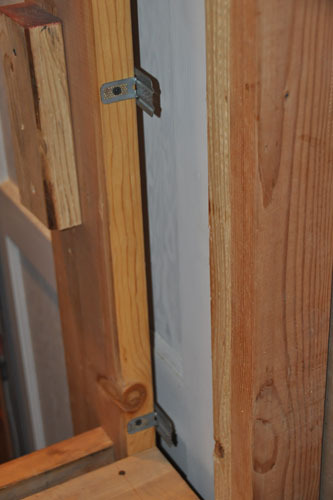 Here's something that gets left out too often: blocking to hang the closet rod off of. Lots of closets I see have rods hanging just on the drywall, which is not great when they end up overloaded with heavy clothes or teenagers who think that would be a cool place to do pull-ups. And here's the finished shelf. We had a weeklong delay on this process because the drywall clips we wanted were inexplicably not available locally -- even the place that said they had them in stock turned out to have none. We had to order them online. 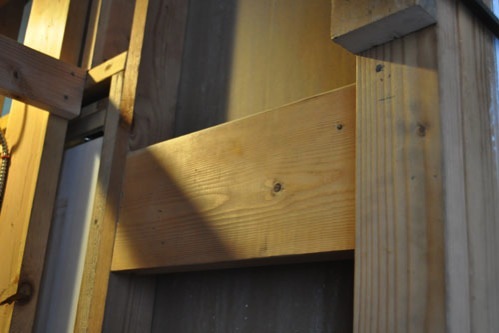 The clips act to support the ends of the drywall in places where we don't want to put more wood framing. I generally dislike using drywall clips, but inside a closet is a good example of a place where they are appropriate. With the clips in place, it was a matter of a couple of hours of fiddling around today to drywall the entire closet (and a little bit of finishing up other drywalling). Now I can go in there and have some quality time with the drywall tape and mud, and soon we will have a coat closet again. There is nothing open about a Victorian floor plan.